You’ve probably got a tangle of rope lying around somewhere. Some of it is rough and brown with bristles that prick your hands. Some of it is bright yellow, smooth, and you think you remember using it on a fishing trip once. Maybe you’ve even got some strands that remind you of shoelaces. 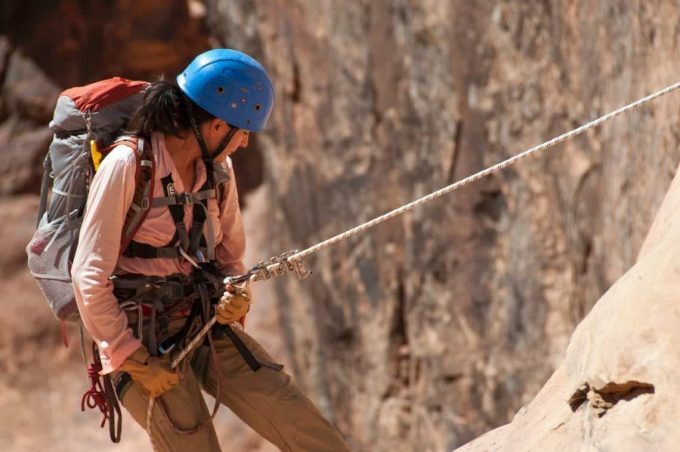 It just doesn’t always seem necessary to take a length of rope with you when you head outside which is why many of us don’t understand the differences between types of rope. Rope is perhaps the most primitive and flexible of gear and one of the most underrated. From length, material, and design, there’s a lot of variability in how a rope is made and what it can be used for. In this article, we’ll talk about the different types of rope for the outdoors and their best application, so incidents like an old bungee cord snapping in your face or a runaway canoe you thought was lashed to your car, become stories you don’t have to live to tell when you get back home. Let’s start with some of the most common types of rope we can utilize, especially on the water. Three strands which are made up of multiple fibers, give us the twisted rope. It typically comes in one of three materials: polyester, polypropylene or nylon. Polyester is the most resistant to mildew and rotting, making it the best option in situations where the rope will be getting wet. As an added bonus, it floats. However, twisted rope is difficult to knot and kinks easily. It’s good to know that the ends can be heated to create a seal that will prevent unraveling though. Plus, this type of rope is very inexpensive. General purposes in boating such as anchor lines. Depending on the diameter you choose, it can augment a tow strap. braid. The double braid is able to hold its shape under pressure which leaves it strong and more resistant to abrasion. It also stands up well to UVA rays and there is a wide variety of colors and widths, depending on what you need it for and want it to look like. Unlike the twisted rope, it is not prone to kinking. Also known as ‘tarred twisted twine’ this rope is either made out of nylon or polypropylene. It’s resistant to water, mildew, rotting, UVA rays, abrasion, oil and gasoline. The tar treatment protects against these facts and encourages knots to hold. 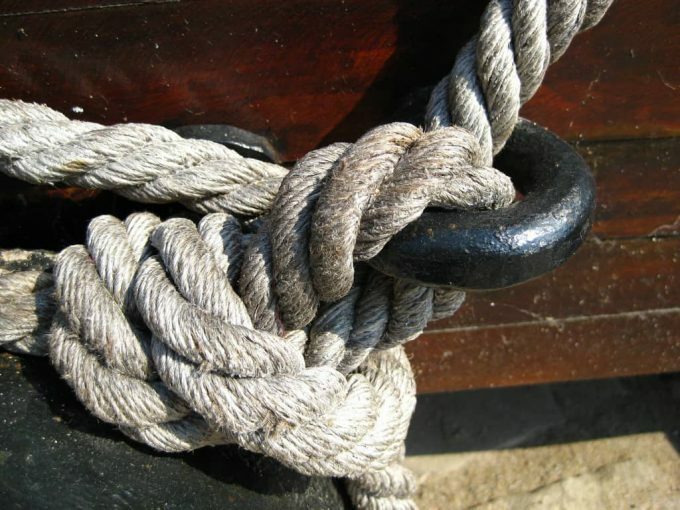 General purposes in boating such as rigging repairs. 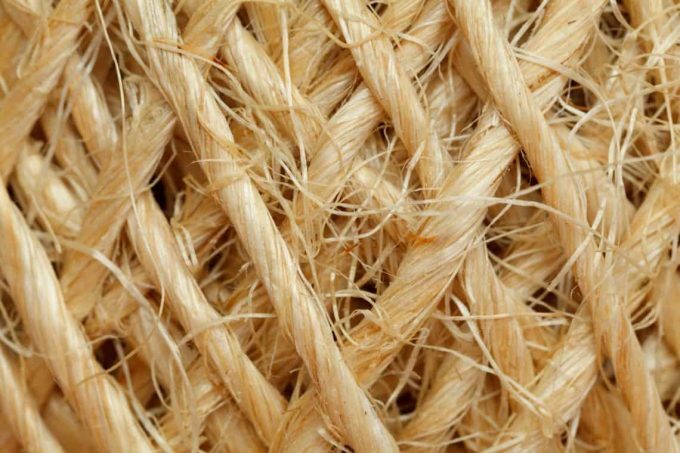 If you’re looking to go the all-natural route, whether it be for style, sustainability, or technical advantages, there are some tried-and-true natural fiber rope options as well. This rope comes from the woven fibers of the Agave Sisalana plant. Watch your hands though! This fiber is bristly and can scratch you up with constant use and without work gloves. Sisal rope resists degradation in salt water but will eventually decompose if left to the glare of UVA rays, rain and wind. 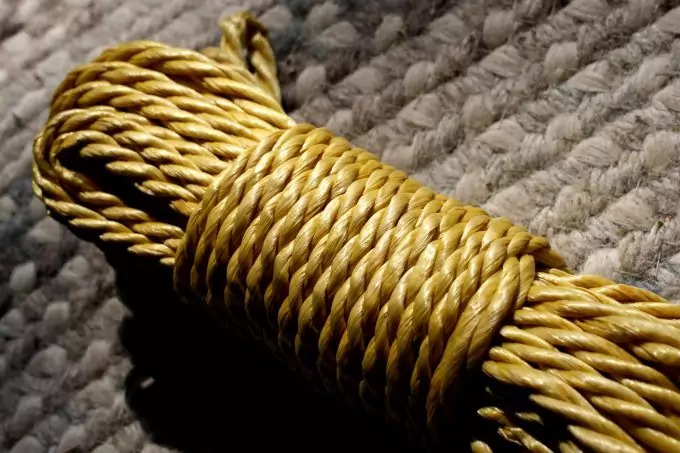 Sisal doesn’t cost much and knots easily, making it another popular outdoors rope option though it is bulkier than some of the other options out there. General and temporary outdoor fixes that don’t need hauling strength as much as they need to be securely tied down. Baling twine is Sisal rope with a smaller diameter. It is also inexpensive and has an impressive minimum breaking strength of about 350lbs. Tying up bales of hay. Manila rope, also called Manila hemp rope, is made from the Abaca plant. Manila rope is soft on the hands, so you won’t be needing gloves to protect against bristles like you would with Sisal after working with this rope for long periods of time. This natural fiber knots easily but shrinks after becoming wet which makes knots harder to untie. 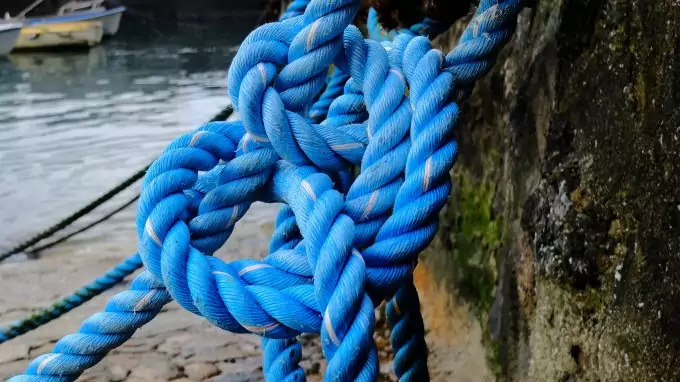 It’s recommended that the rope be wet and dried without being knotted first, so the initial and most drastic shrinking occurs without a problem. Manila ropes are resistant to salt water damage but should not be stored wet as much as possible because mildew and rotting can occur. Hammocks and other outdoor furniture. And it’s great for playing tug-of-war at the family reunion! ProManila or UnManila is not a natural fiber rope, but it does look like Manila. It’s made from polypropylene which means it will not shrink or rot and it lasts longer. The downside? Cost. It is more expensive than it’s all natural predecessor and it is susceptible to UVA ray damage. The next series of ropes I consider the most useful for outdoor activities such as backpacking, camping and climbing. Bungee cords are elastic bands covered in a sheath of cotton, nylon or polypropylene. They usually come with wire hooks at the end. The elastic will wear out, especially if stretched taught for extended periods of time and through exposure to the elements. Before using, check for signs of wear such as tears in the sheath and flat sections of the rope where the elastic band may be broken. Remember, pulling too tightly can cause the rope to snap back at you. Use care. Bundling gear that needs to be rolled, like sleeping pads. Walking around your tent by headlamp light just got a whole lot less precarious. One of the huge benefits of Guyline cord is that the nylon cord can also be made with reflective material. Which means when you hear nature’s call in the middle of the night, you’re not going to trip over your tent and rainfly lines. Guyline is lightweight and thin, which makes it easy to pack a length in your backpack or car. Auxiliary tent and rainfly rigging. Creating dummy cords by looping around gear like flashlights and water bottles to make it easier to find them in the dark. Tying gear to packs and belts. Climbing ropes are constructed using a design called kernmantle. The sheath (mantle) protects the core by resisting abrasion and the strength of the core (kern) is where the power of the rope lies. The core is able to be stretched out to create a lifesaving adjustment. For tips on how to choose the best climbing rope, see our earlier piece. Otherwise called a “dynamic” rope, the stretch prevents a climber from coming to an abrupt stop when free falling, keeping the spine intact. Static ropes are for top roping, repelling and can be used to haul gear. The downside? Because this is considered a specialist rope, it runs a bit more on the expensive side than the other options we’ve explored. Ski ropes woven together by many fine strands to create a hollow braid. They are typically made out of polypropylene which makes it lightweight, strong and the buoyant. It weakens and degrades in UVA rays and does become slippery when wet, however. General use in waterskiing (such as towing) and camping. Tying paddles to canoes and kayaks. Paracord’s versatility, light weight, compact size and high quality all make it a staple in an outdoorsperson’s collection. Paracord, like climbing rope, has kernmantle construction and is made out of nylon. The inner core is made from seven to nine strands of cord (typically white) which are woven together. It was originally used by the United States Military as suspension lines for parachutes on World War II and has since found its way into civilian life. 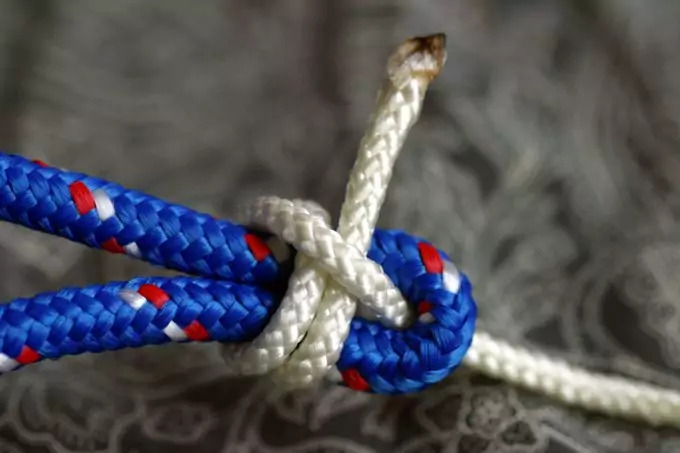 To learn the many types of knots for paracords, see our piece to give you more options. While there are different types of Paracord, Type III or 550, is the military specification, having a minimum breaking strength of 550lbs. Getting Paracord wet is also no problem. Because it is nylon, it dries quickly and will not rot or mildew. Another factor that makes Paracord so useful is that you can separate the sheath from the core and use the internal cords for sewing thread. Be wary: Commercial grade Paracord is not required to meet the same standards as military spec Paracord and it can be difficult to tell the difference. Because we want to be able to depend on our rope in whatever situation we find ourselves in, here are some tips on how to identify genuine military spec Paracord. On the Labeling: Look for the terms “550”, “Type III” and “MIL-C-5040H”. Made in the USA is also a good indicator that this Paracord is genuine. On the Sheath: Here’s where it gets tricky. Commercial and military spec Paracord look very similar on the outside. Look for both the core and the sheath to be made out of 100% nylon. Color is a clue here too. Military spec Paracord comes in specific natural colors (think camo) whereas commercial Paracord can be any color of the rainbow. On the Core: Cutting through the sheath and opening the core, you should see 7-9 individual cords that are either twisted or braided. Military spec Paracord has 3 ply twists on each cord and one will be color coded, the other cords will be white. Improvising a shelter (A Frame, Lean-To). And finally, we have some options that are technically not rope but function as such in terms of ability to haul weight or lash securely. Tow straps are a great asset to those who are venturing into the wilds with a car. The woven straps have loops sewn in for hooks or already come equipped with them. A tow line can also be combined with twisted rope if the straps need to be lengthened. Straps rated for 20,000 to 30,000lbs should be able to get most jobs done. Easily attaches to tow bumpers and hooks. It can also be used to haul boats and other heavy loads. Also known as cable ties, they are typically made out of nylon and were originally used to bundle electrical cables. Today, they are suitable for a variety of uses, especially for the outdoors but caution is required when attaching them to any part of the body as they are easily tightened but are not easily removed by cutting the loop. A note on color, the black zip ties are the least resistant to UVA ray damage. Zipper pulls and shoe laces. Bringing two pant loops together to make a makeshift belt. Lashing tarps together for shelter. Securing pants to ankles to prevent bugs from crawling up. Securing lights and lanterns overhead. The universal in any outdoorsperson’s cache, you can twist duct tape together to create a rope and repair just about anything, at least temporarily. We’ve discussed everything from the classic Manila rope to modern day’s extremely versatile Paracord and the crowd favorite catchall, duct tape. We’ve broken down rope materials, design, construction, and listed the best uses for each type of rope you might use in the outdoors. 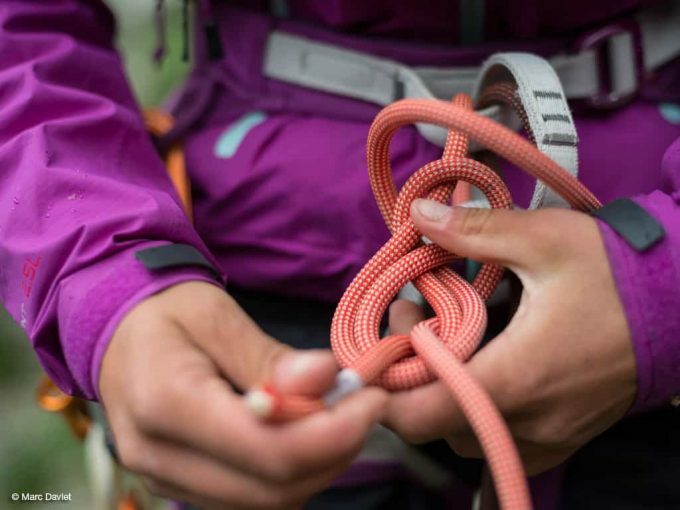 Choosing the right rope for your adventure is no less important that choosing any other part of your gear. 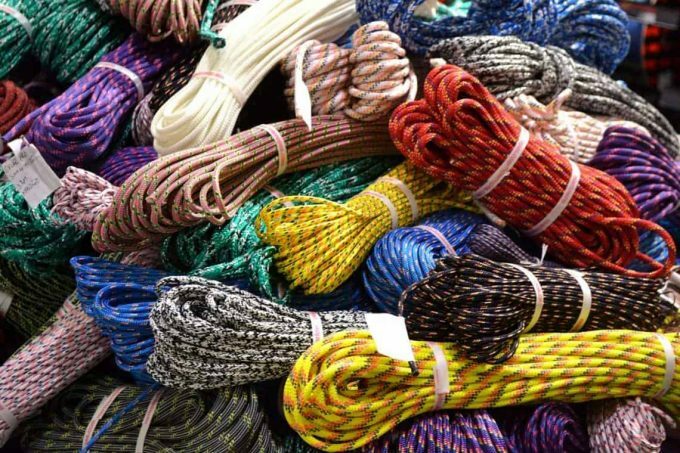 With an understanding of the variety and versatility of rope available to you, purchasing the right rope for your project will be a much more streamlined process. Knowing the strengths and weaknesses of your rope will also allow you to problem solve in the event of the unexpected occurs that much better. Before your next adventure, check out our must-read article on how to select for the best climbing gear to give you more options. What type of rope will you be using for your next adventure or project?